This durable powder-coated aluminum constructed callbox with a self-closing door is ideally suited for outdoor use where harsh weather conditions or corrosive chemicals may require a protective housing. Also compact enough for use indoors in entranceways and hallways. The A1 can be flush mounted to a wall or bracketed to a pole. Locating this unit throughout a facility can save on manpower and improve emergency response time. This callbox system, popular for education, medical and corporate campuses and parking lots; combines the A1 callbox with a white powder-coated aluminum stanchion and a blue strobe light. The unit can easily be installed in soft ground, or with our optional base pedestal, anchored onto hard surfaces in minutes. Forget the expense of contracting for trenching and electrical work...these obstacles have been eliminated! With its completely wireless solar design, now all you have to budget for is the callboxes! Designed with traditional wall beam width dimensions in mind, this system can be flush-mounted. Slightly smaller than our ACB model, the door less FMACB unit is also useful for requesting assistance in an elevator, making reservations at a resort, renting a car at a terminal, hailing a cab, and will complement your organization's customer service efforts. Also ideal as an entry system, two-way communication can be used to summon guards, announce deliveries or request a lock release. Locating these units throughout a facility can save on precious time and manpower. One of our most popular units, this callbox is ideal for making reservations at a resort, renting a car at a terminal, to hailing a cab, this door less unit will complement your organization's customer service efforts. Also ideal as an entry system, two-way communication can be used to summon guards, announce deliveries or request a lock release. This compact unit can easily be mounted to a wall or bracketed to an existing pole. Locating these units throughout a facility can save on precious time and manpower. All the great sophisticated, patented features of our other door less models, this unit's sleek 4 foot frame houses an automatic strobe light. Great for high-profile corporate campuses, its stylish compactness allows hallway or exterior pole installation in as little as one hour. This model can be loaded with all the bells and whistles at a surprisingly affordable price. 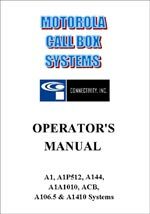 A144 Callbox Available through Connectivity's Authorized Agents. Also available through your local MOTOROLA Dealership. This 6.5-foot tall, 5-inch deep frame callbox is the newest Connectivity design. A base stand, formed into the stanchion, allows for effortless installation in minutes. Placement in narrow hallways and other constricted spaces is now a simple task. The callbox's enclosure has an easy access battery compartment for storage of its more powerful battery. This enhanced battery, which lengthens the units standby time, permits the callbox to be placed in locations typically unsuitable for solar products. Low sunlight areas and dark hallways are now suitable sites for this system, and do not require an AC/DC charging power source. This callbox comes with all of the standard features at the incredible low introductory price! All the great sophisticated, patented features of our other door less models, this 10 foot tall design comes with a low-power consumption LED, which operates as a locator light in dimly lit areas. Once the call system is activated, the light automatically changes to a strobe mode. Our solar model comes with a higher 10-watt solar panel to ensure power dependability. This handsome unit is great for high-profile corporate campuses. Its sleek "next generation" styling makes a great presentation and can blend in with any architecture. The system can easily be installed in soft ground, or with our optional base pedestal, anchored onto hard surfaces in minutes. Setting new standards for quality and design, we have included all of the features of our aluminum callbox in a stainless steel enclosure. Made of resilient 316 powder-coated stainless steel and featuring a self-closing pneumatic door, this system elevates callbox design to a new level! An optional, scheduled 24-hour check-in features eliminate necessary service inspections and verifies, in report fashion, that each callbox is in working order. All of the advanced patented features of our MACONE call box, plus the added sophistication of a 4-button notification panel. Also, each button can be customized; such as, MEDICAL/POLICE, MECHANICAL/TOWING, GAS/TIRE, and HEARING IMPAIRED. 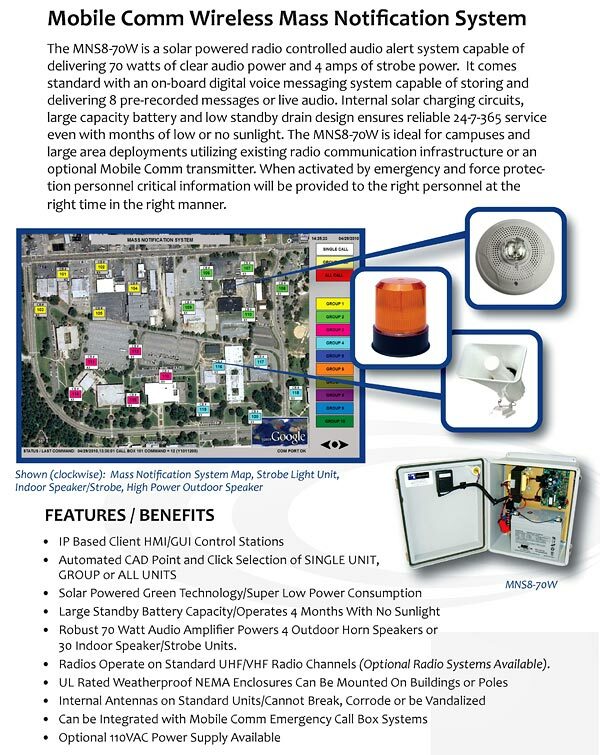 This software-driven unit sends automatic audible and digital signaling to a dispatch center. Microprocessor controlled, modular conformal-coated boards, fully expandable design and TTY/ADA compliant are all features synonymous with this unit. The most durable callbox in the world, it can be found on major interstate roadways, bridges, tunnels and commuter rail stations. This system brings next generation technology to our customers today! NOTE: We are currently updating our Product Sheets. If you would like more information on one of the above products, please email us at info@connectivityinc.com. Please check this site at a later date for downloadable PDF files. We are sorry for the inconvenience. These files require Adobe Acrobat Reader..